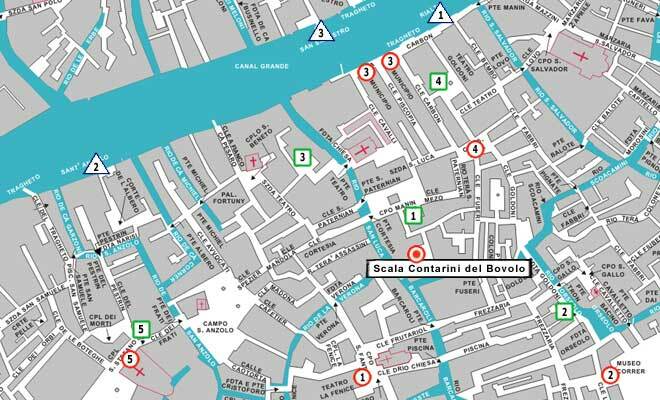 Venice Hotels Guide See Scala contarini del Bovolo on the interactive Map of veniceXplorer. 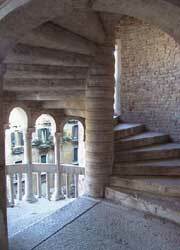 The family hired a second architect, Giorgio Spavento, to add the staircase to the original structure. 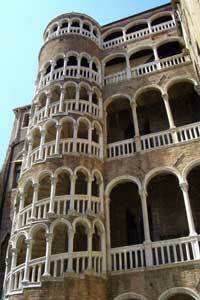 The spiral is often compared to the snail’s shell (bovolo) and hence the palace got its name as “snail house”. There are two small courtyards and several wellheads at the base of the tower. Many of the wellheads belong to previous structures and are far older than the palace although one bears the Contarini family coat-of-arms and was probably added at the time of the palace’s construction. 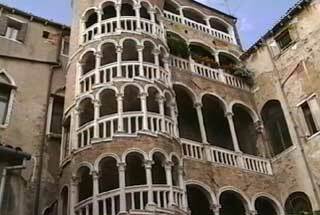 Architectural elements of the first Renaissance merge to the building techniques Gothic-Byzantine, producing a harmony of forms, with a typical Venetian character, in a monument that is unique in its type. From the dome of the belvedere it is possible to get a splendid and unusual panoramic view of Venice: the roofs, the bell towers, the domes of Saint Mark. It is, no doubt, a privileged observation point over the city. 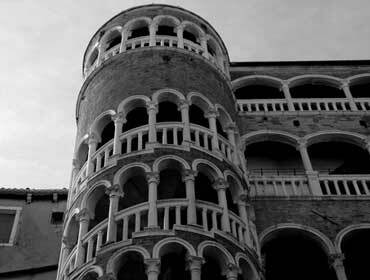 Nowadays the palazzo is under the custodianship of the Association of St Apollonia. Everyday at 10 a.m.- 6 p.m.
Saturday and Sunday from 10 am to 4 pm. Special opening upon request. Christmas time and Carnival, open all day from 10 am to 5 pm.